Join our mailing list (below) for more details about future cafes! Questioning a Japanese Obsession with Fluent English"
Masahiko Abe is Professor in English at the University of Tokyo. He is the author of a book attacking Japanese government reforms to University English entrance exams entitled "Shijō saisaku no Eigo seisaku"—“The Worst-Ever English Policy” (2018). His other publications include "Modernity and the Strategy of Boredom – Oe, Stevens and Avant-garde" (2001), "Improvisation and Literature" (2004), "An Introduction to Poetry in English" (2007), "On Slowmotion" (2009), "How English Works" (2010), "Understanding Japanese Fiction: Some Notes and Insights" (2012), "Staring and Literature" (2012) and "Discovering Poetry" (2014). He is also a translator of Frank O’Connor’s short stories and Bernard Malamud’s "The Magic Barrel". He won the Waseda Literary Award in 1998 and Suntory Prize for Social Sciences and Humanities in 2013. 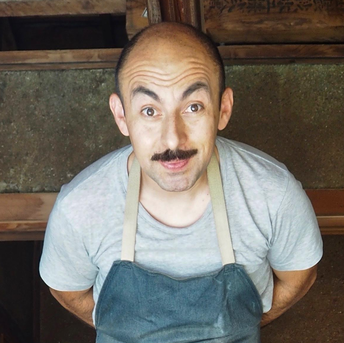 "Traditional Woodwork, Design, and Hands-on Living"
Francisco Martínez is an architect from Mexico and furniture-maker based in Saitama’s countryside. 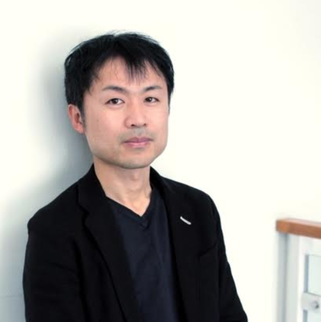 He designs wooden furniture that draws on Japanese traditions, practices farming, and collaborates on interior and architecture projects. 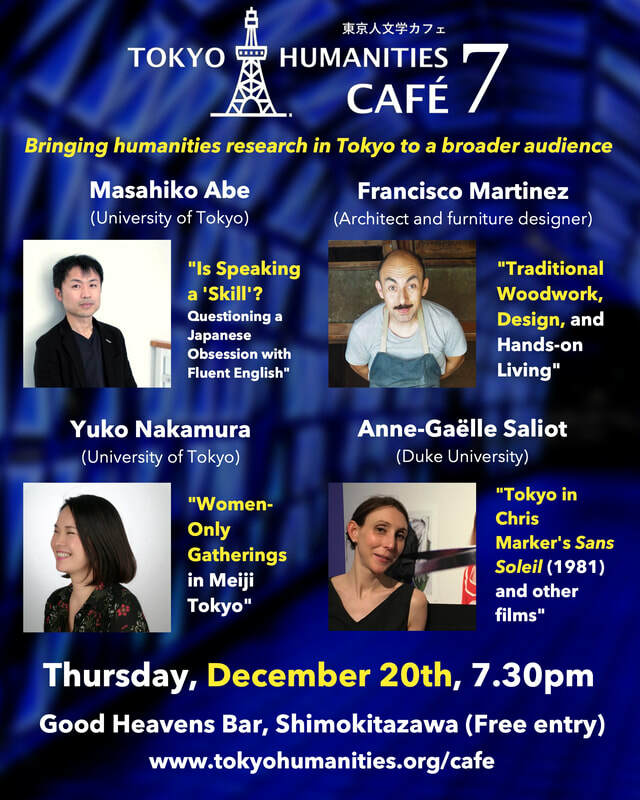 ​"Tokyo in Chris Marker's Sans Soleil (1981) and other films"
Anne-Gaëlle Saliot is Associate Professor of Romance Studies at Duke University. Her first monograph,The Drowned Muse, was published in 2015 by Oxford University Press. 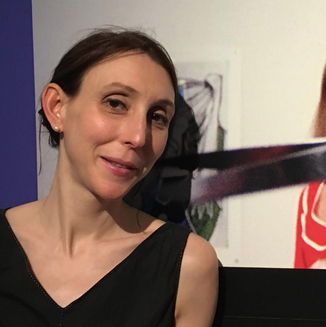 She has published on theory (Blanchot), cinema (Truffaut, Godard, Pialat, Rivette), 20th and 21st century French literature, and dance. She is currently writing a book for Northwestern University Press on the French New Wave and the 19th century. She co-edited the Cahier de la NRF dedicated to the French writer Philippe Forest. 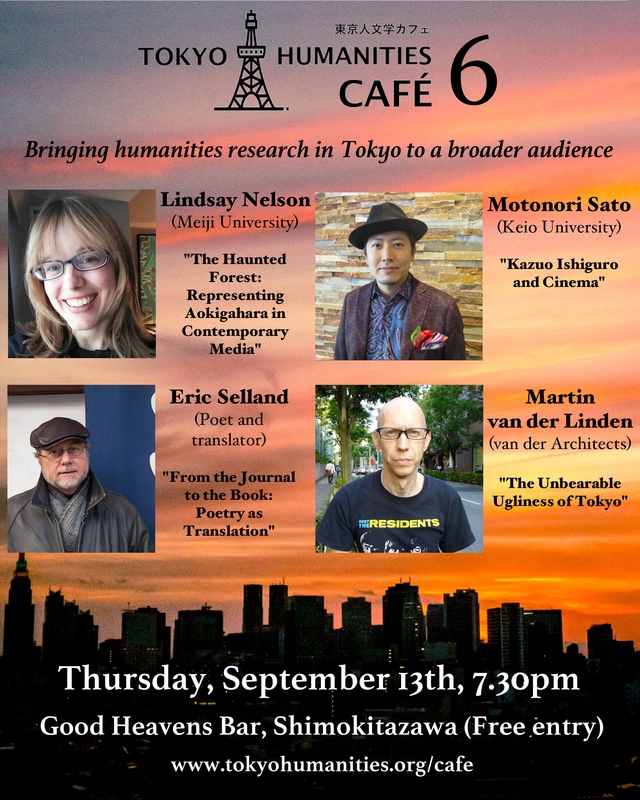 Her newest project investigates the imaginary of Japan in French literature, cinema, and dance from 1945 to the present. Events are held at "Good Heavens" (グッドヘブンズ) bar, five minutes' walk from the south exit of Shimokitazawa station (see below for a map). ​The bar regularly hosts comedy events and film screenings and has lots of comfy chairs and a cosy atmosphere.